On Wednesday Tiger Woods got a “picture” taken of his neck to figure out what was causing the pain (in his neck) that forced him to withdraw in the final round of The Players. 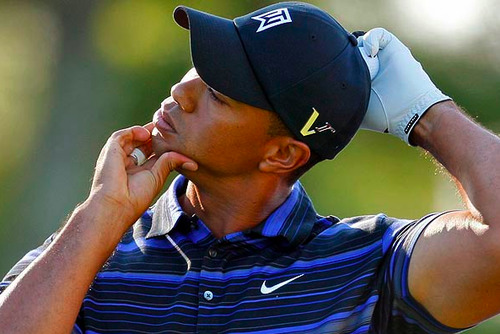 Via his website, Team Tiger revealed that the MRI determined Tiger has an inflamed facet joint in his neck. When facet joints are inflamed, they cause pain, headaches and difficulty turning the head. According to some website called SpineUniverse.com, “Facet joints can become inflamed secondary to injury or arthritis.” Now could that injury be caused by, say, a car accident? Or maybe Tiger has early onset arthritis. Or he twisted it from looking over his shoulder so much in the past six months. According to TigerWoods.com, the injury will be treated with physical therapy, including soft-tissue massage, rest and anti-inflammatory medicine. Someone get him the number for a good therapist specializing in Swedish Massage. Huge. Quickly. Translation: He’ll be back in time for the US Open at Pebble Beach and maybe The Memorial for a warm-up. Next time someone gets an inflamed facet joint, they’ll kind of identify themselves with Tiger Woods.